December 6, 2018 at 12:10a.m. There is always bad news coming. That, as United Auto Workers Local 1112 vice president Tim O’Hara put it, is an innate understanding every autoworker comes to accept. Not that the union official doesn’t enjoy the job; though retired, he knows that without a product at the GM Lordstown Assembly plant, he and his family will have to leave the Mahoning Valley. O’Hara may not be fighting for his job, but he is fighting for his home. 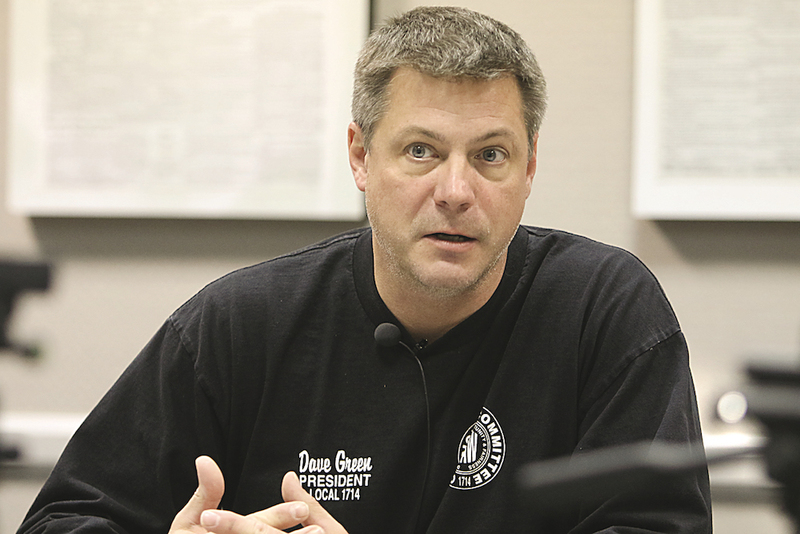 Since the announcement, he and the union’s president, Dave Green, have been working long hours to try to keep their membership informed of the evermore amorphous developments regarding the 52-year-old facility. The two met Wednesday with Vindicator editors and reporters to discuss GM’s decision to cease production at Lordstown and four other facilities across North America. GM announced Nov. 26 that it would indefinitely idle the Lordstown facility beginning March 1. Uncertainty always haunted the plant, as the years brought layoffs, work outsourcing and, more recently, the combination of the Local 1112 and the Local 1714. Now that uncertainty has spread well beyond the borders of Lordstown. Green shared that his daughter, a senior at Boardman High School, was one of several students in her class whose phones buzzed simultaneously with worried texts from parents alerting them to the news. “They were all getting anxiety because every kid in that group was getting a text from a parent who was either a GM worker or a Magna worker or who worked for one of the suppliers,” Green said. On Wednesday, U.S. Sens. Sherrod Brown, a Cleveland Democrat, and Rob Portman, a Cincinnati-area Republican, met with GM CEO Mary Barra in Washington, D.C., to address that rippling anxiety throughout the Valley by making a case for the continued operation of the Lordstown plant. U.S. Reps. Tim Ryan, of Howland, D-13th, and Bill Johnson, of Marietta, R-6th, met with her in a separate session. After the talks, Portman said he and Brown had a “good, very candid” conversation with Barra, but she did not give an indication that any commitment to save the plant was forthcoming. “This is the commitment that we’ve received so far: One, as Senator Brown said, they are ongoing negotiations. I think there’s a September or fall deadline for the UAW contract. Both of us want to be sure that both the company and UAW expedite that as much as possible to get to a decision so there is less uncertainty. She agreed that was a potential opportunity. Also, she has said to us that she is going to keep an open mind but does not want to raise expectations,” Portman said. Brown said the company is looking for opportunities to move workers to open positions in other plants around the country, but the number of jobs available is finite and that not every worker is going to want to leave the area to work in another plant. Brown said he and Portman had pushed Barra hard for decisions, noting the hardship the uncertainty of the plant’s future had wrought not only on the workers, but on the adjacent businesses and families that will be impacted by GM’s final decision. Johnson said he would keep fighting “until GM brings a new product to Lordstown or a new company comes in and takes advantage of the existing facility and highly skilled workforce” and questioned why a retooling of the existing plant wasn’t being considered as an option by the company. Back at home, the UAW continues pushing the “Drive it Home” campaign, hoping to harness local support for the company and the workers to convince GM that Lords-town is not a liability. On Wednesday night, Niles City Council joined other Valley municipalities by passing a resolution declaring its “full and unconditional support” for efforts to save the Lordstown complex. But the union members know that neither the campaign nor the pleading of politicians alone will save the plant; Barra, after all, answers to company shareholders, and judging by the 5-percent jump GM stocks saw Nov. 26, the plight of the Lordstown worker doesn’t seem to be a priority in the boardroom. O’Hara and Green both said they’re still hopeful GM will decide to put a new vehicle line at the Lordstown facility. December 23, 2018 12:09 a.m.